VANES MARTIROSYAN: "I'M MUCH BETTER THAN HIM...I REALLY WANT CANELO"
"Saul is a great fighter. I respect him, but, you know, I don't think he's higher than me. I think that I'm much better than him. I hope he gets past Rhodes and I hope he takes the fight....I'll teach him a lesson, like Mayweather did to Arturo Gatti....It's going to be a good boxing match for me. You know, I really want Canelo. I hope he steps up and fights me," stated undefeated jr. middleweight contender Vanes Maritrosyan as he talked about his future plans after his recent victory over Saul Roman this past weekend. Check out what else he had to say! AP: Hi Vanes. How are you doing? VM: I'm doing good Andrew. Thank you. What's going on bro? AP: Yeah, everything's going good, man. Congratulations on what I thought was a pretty awesome victory on Saturday night, man. That was pretty cool. VM: Thank you. I put a lot of hard work into that fight. AP: I'm going to be honest with you, at the very end of the fight, when you were hitting that guy in the head, it reminded me of Rock 'Em Sock 'Em Robots; I was afraid you were going to knock Roman's head off, dude. VM: Yeah, man. I mean, I don't want to hurt nobody that bad; it's just what you got to do to get a stoppage. AP: I know. I was thinking, "Wow! Is this ref going to stop this?" You hit him with some good shots. That was a great performance. You should be proud of yourself. VM: Thank you. I think the ref did a great job. It was a great fight for me. I learned a lot from the fight and I'll take it on to the next fight. AP: So how are you feeling? I know it was a tough fight, and he was a rugged fighter, so how are you feeling? VM: You know, I thought my head would hurt a little more than it's hurting after the fight, but I feel good. AP: I like to see you guys fight hard, but I want everybody to be safe and healthy too, so that's good. So it's my understanding that Saul Alvarez is your mandatory now, which is a fight that I think everybody would love to see. If he wins his next fight, do you think that is a fight that we may see in 2011? VM: I hope so. Saul is a great fighter. I respect him, but, you know, I don't think he's higher than me. I think that I'm much better than him. I hope he gets past Rhodes and I hope he takes the fight. AP: If that fight happens, how do you see it playing out in the ring? VM: It's going to be a good boxing match for me. You know, I'll teach him a lesson, like Mayweather did to Arturo Gatti. AP: (Laughing) Whoa, man! I think it would be a pretty cool fight. I would love to see it happen. I mean, he's a young champion, but there is so much hype around him. You know, it would kind of surprise me if it happens, but for you, for him, and for boxing, I hope it does because it would be a good fight. VM: Yeah. It would be good for both of us. You've got to give the fans what they want to see. I don't know, I think it will be great. I stepped up to him. I hope he steps up. AP: Me too. Do you plan on taking an interim fight in between now and whenever that fight might take place? VM: If that is so, I will have to speak to some of the team to see what's up. Why would we do that? Because right now, I feel like I should go for the world title already. I've had so many fights. I don't think I should take anymore fights and just go for the big one. But we'll see. Whatever it is, I'm ready for it. AP: If that one doesn't pan out, where do you plan on going from there, or do you even know right now? VM: I have no idea, bro. You know, I would have to think about it. AP: Do you plan on staying at 154? VM: I mean, right now, yeah, but if I have to move up to face somebody for glory, or something like that, then I probably would. AP: Chavez Jr. is fighting right around that weight class. Did you happen to see his fight on Saturday? AP: Any thoughts on him as a possible an opponent, or on how he did on Saturday? VM: I think he did enough to win. If Zbik had a little bit of punching power, I think the fight might would have been different 'cause Chavez got hit a lot. We don't know. I mean, Zbik does not have the power to stop Chavez and I think Chavez did enough to win. AP: You guys have been sparring together some, right? AP: With the news of Floyd Mayweather fighting Victor Ortiz, what do you think about that? I mean Victor is a guy that has been fighting at 140, but he's been coming in at nearly 160 for his last couple of fights, so I mean, he may be a guy that would be up around your weight at some point. What do you think about that matchup between Mayweather and Ortiz? VM: I mean, I've sparred Ortiz before and I did really good. I think I was the first person to drop him, in the first round, and he told me that was the first time he had ever been dropped, so if me and him were to fight, I think I could take him out. I don't think he would handle my power, but him and Mayweather, I think, is a good fight. I want to see it. It's exciting. Victor, mentally, is prepared. And that's a big fight that he's taking. AP: Yeah, I think so too. With him being a southpaw, and he's quick, and he's strong, I think it's going to be an exciting fight. VM: Well, Mayweather is Mayweather. He may do magic! AP: Yea! (laughing) My last questions is kind of just a hot topic in the sport, you hear a few guys talking about it hear or there, and I just like to get the fighters' take on it. What do you think about the random style blood testing in professional boxing? VM: I think that would be great because it would keep a lot of fighters focused and honest, you know? I think it would be great. For somebody that doesn't do anything, I think it would be great, but I don't know for people who actually do stuff. I certainly hope not, but I don't know, I don't have a problem with it. I think it's a good thing. I like to keep the sport faithful, and I'm one hundred percent natural with it. AP: I agree with keeping it natural too, and just to let you know, so far, every fighter that I have asked has been for it. I'm wondering if at some point, maybe the commissions will revise their testing procedures. Hopefully so, because I'd like to keep and see you guys safe. VM: Yeah, because in the Staples Center fight, I remember I did a drug test, then I did a steroids test also. Everybody was doing that. It was really great. Even the undercard fighters where doing the steroids tests. AP: Well Vanes, I really appreciate you taking the time. Before I go, while I've got you, is there anything that you would like to add or say to the readers over at FightHype? VM: I want to thank you guys. I really want Canelo. I hope he steps up and fights me. 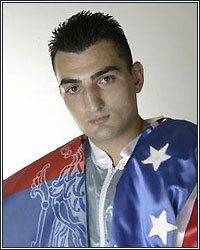 To all my fans, follow @VanesBoxing on Twitter and Vanes Martirosyan on Facebook. Thank you, and God Bless.